The purpose of this website is to show the Porsche factory showroom sales literature for early 911 and 912 Porsches from the period 1963 to 1973. Included will be showroom brochures, price lists, color charts, and any other available sales media used by Porsche and Porsche authorized dealers. Scroll down and you will see a variety of historical showroom sales brochures published by Porsche from the earliest days of the 911 & 912. Thanks for stopping by! 911-912 Porsche Sales Brochures 1963 to 1973! Here are four factory booklets that are crammed with technical information about 911/912 Porsches! Porsche 901 Coupe Brochure, W221e, September 1963, English. A very early Porsche 901 from above brochure. Notice the hubcaps. See any other differences? 901 - 911 Porsche, September - October 1964! 901/2000 Technical Data, English, September 1964. 911 Technical Data, German, October 1964. Porsche 911 Coupe Brochure, W221, October 1964, German. Porsche 911 interior from October 1964 brochure. 911 Porsche 2+2, Undated (Late 1964 or Early 1965)! Porsche 911/2000 2+2 Coupe Brochure, Porsche of America Corp., Undated, English. 1965 Price List Folder for the 356-C & New 911 (right half of image above is the cover)! Inside of 1965 Price List Folder! Images provided by John Bell. Porsche 911 Coupe Brochure, W221, March 1965, German. NEW: 911 Porsche Advertising Folder, 1965! Early 1965 Porsche "911 Hints to Drivers" folder. Images provided by Jim Alton. 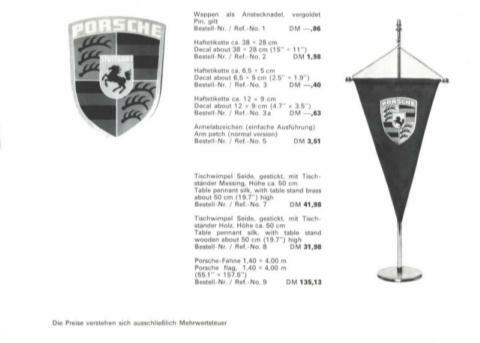 911 Porsche Accessory Price List, 1965! 1965 911 Price List. Image provided by GN, Geneva. 911, 912 Porsche, Undated 1965! The first Porsche accessory Air Condition System. Image provided by John Bell. Click here for additional information on the earlier A/C units for 356 Porsches. 911 Porsche Price List, 1965! 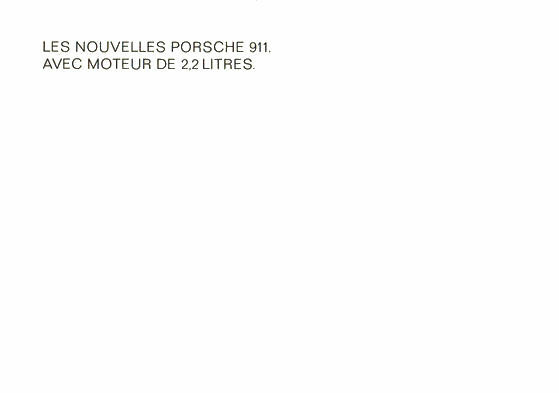 1965 Porsche 911/912 Sunauto (Paris, France) Price List. Image provided by GN, Geneva. Porsche Color Chart, May 1965! 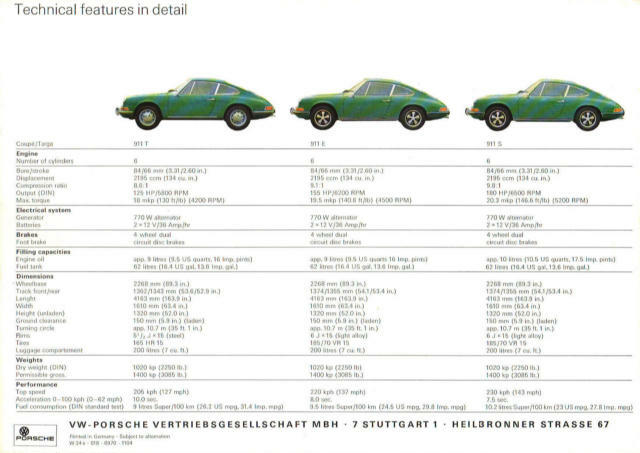 Porsche 911/912 Color Chart dated May 1965! Click here for information on the earlier Colors for 356 Porsches. Porsche 912 Brochure, W295e, April 1965, English. Standard Equipment Listing, 912 Sales Brochure dated April 1965. NEW: 911 l 912 Porsche Price List, August 1965! August 1965, Porsche factory 911/912 Price List in English. Images provided by TJS Geneva. 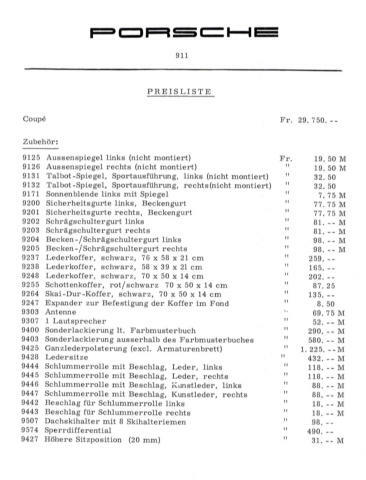 August 1965, Factory 911/912 Price List in German. Images provided by TJS Geneva. NEW: 911 & 912 Porsche Tourist Delivery Folder, August 1965! August 1965, Tourist Delivery Folder. Porsche 911 Service Postcard. Image provided by KN, Geneva. Porsche 911 Coupe Brochure, W28, August 1965, English/French/German. 911-912 Targa Porsche, September 1965! Porsche 911-912 Targa Brochure, W225, September 1965, 4 Language Version. 911, 912 Porsche, October 1965! 911/912 Accessory Price List, September 1965, 10/65 version. 911/912 Accessory Booklet, September 1965, 10/65 version. Wood Steering Wheel (left), Black Horn Button (right). Porsche 911, October 1965, Image provided by John Bell. If you have a brochure like the one above to sell, contact me by clicking here! Porsche 911 Brochure, W221e, November 1965, English. One Gorgeous Red 911 Porsche! I'll' take several! Porsche 912 Brochure, W223e, November 1965, English. 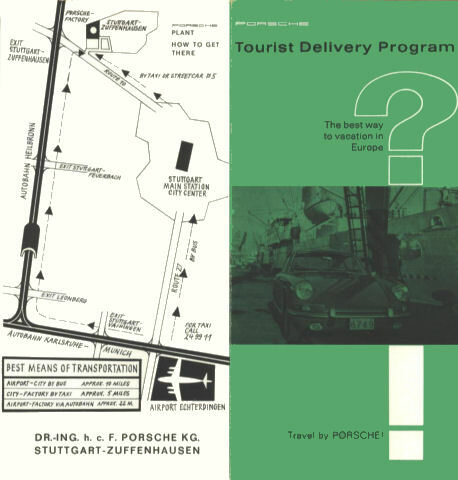 NEW: 911-912 Porsche Tourist Delivery, November 1965! Tourist Delivery Folder, November 1965, Image provided by John Bell. NEW: 911-912 Accessory Price List, March1966! March 1966 Accessory Price List, German language version. Images contributed by TJS Geneva. 27. 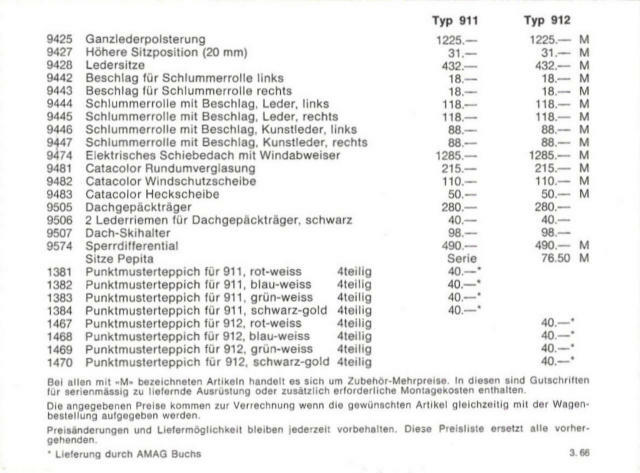 This "1966 911-912 Accessory Price List" in German is dated March 1966. It lists factory accessories for both 911's and 912's. 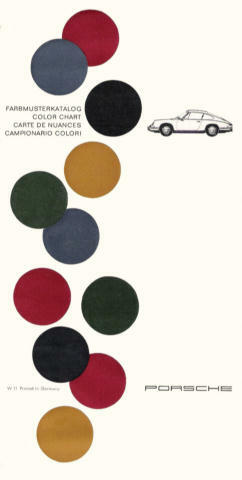 NEW: 912 Deluxe All Color Brochure in Italian, May 1966! 28. This "1966 912 Deluxe Sales Brochure" in Italian is dated May 1966. It covers only the Porsche 912, and includes some beautiful pictures of Coupes and Targas. 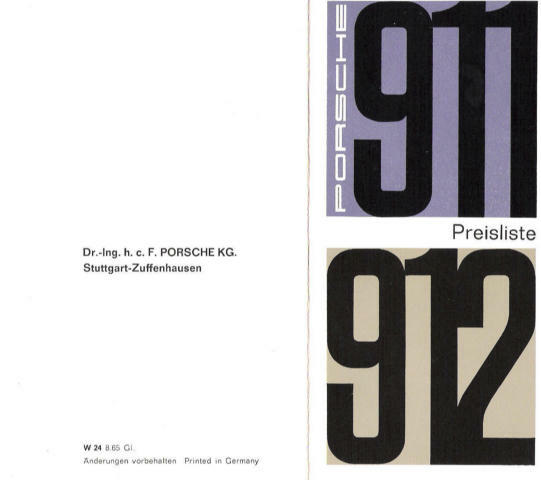 The cover is all white with "PORSCHE 912" embossed in the lower right corner of the cover (barely visible in the cover picture). The stamp on the cover is for a dealership in Milan in north central Italy! 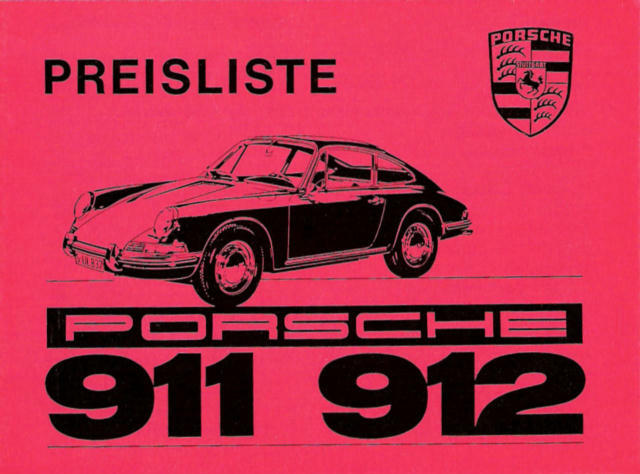 NEW: 911-912 Porsche Price List, July 1966! July 1966 911/911S/912 Factory Price List. Image contributed by TJS Geneva. 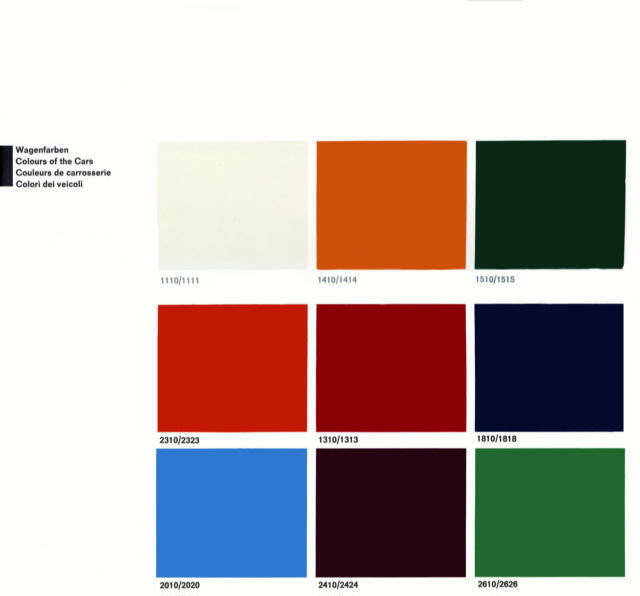 911-912 Porsche Color & Interior Sample Book, 1966! 1966 Porsche 911/912 Exterior Color and Interior Sample Book! Images provided by TJS Geneva. 911-912 Porsche Coupe Brochure, W215, September 1966, English, German, French. 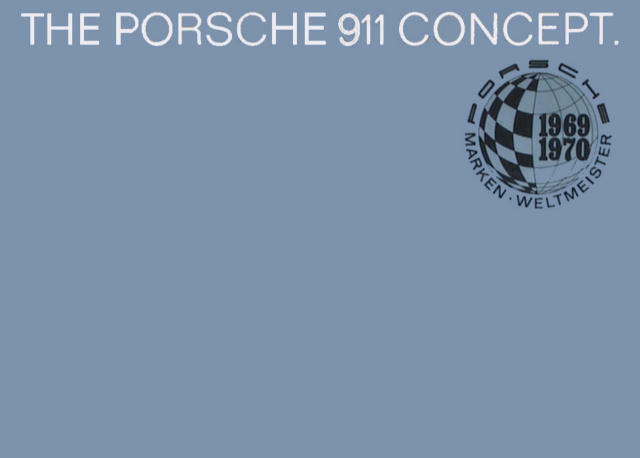 911-912 Porsche Folder, undated Est. 1966, English. 911 & 912 Porsche, Undated1966! 1966 Porsche Promotional Postcard. Image provided by KN, Geneva. Porsche 911-S Coupe Brochure, W213e, September 1966, English. 911, 911-S, & 912 Porsches, November 1966! 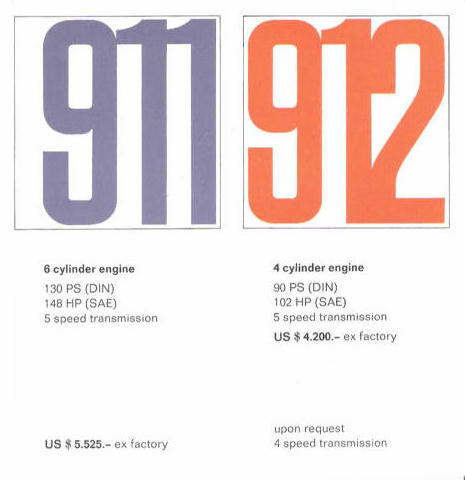 911/911S/912 Accessory Booklet, July 1966, 11/66 version. Chrome wheels v. Forged Alloy wheels. Click here for 912 Porsche Exploded-View Part Diagrams For Sale! 911-S Porsche, Undated late 1966 or early 1967! 911, 911-S, & 912 Porsches, Undated 1967! 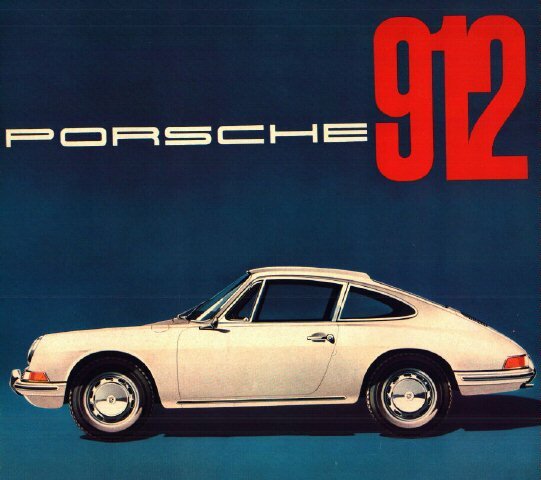 Undated 1967 911, 911-S & 912, 28 page brochure. Back cover shows Standard and Optional Equipment. Inside page has information about the Porsche Carrera 6. Porsche Brochure for the "Targa" from 1967, Image provided by John Bell. 911-912 Porsche Tourist Delivery, Undated 1967! Tourist Delivery Folder from 1967, Image provided by John Bell. 911, 911-S, 912 & Targa Porsches, Undated 1967! The "4 in One" 912 Targa brochure, undated but probably 1966 or 1967. Lots of options with a 911, 911-S or 912 Targa! Porsche 912 Single Sheet, Undated 1967, English. Porsche 911 Single Sheet, Undated 1967, English. Porsche 911S Single Sheet, Undated 1967, English. Porsche 911. 911S. 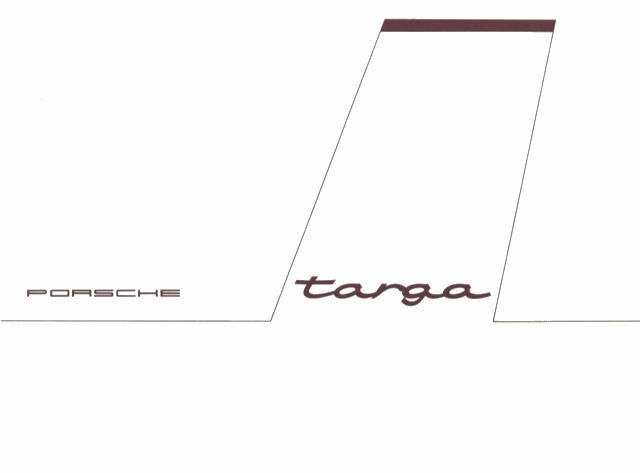 912 Targa Single Sheet, Undated 1967, English. 911-T, L, S & 912 Porsche, August 1967! Porsche 911 T, L, S & 912 Coupe & Targa Brochure, August 1967, English. Now............isn't that one FINE looking 912 Porsche? Porsche Racing Victories, 1967, Single Sheet. 46. This "Rennsportjahr 1967" is a single sheet printed only on one side listing important racing victories for 1967. The sheet is not dated, and there is no indication of who published it. It is likely that it was printed in late 1967 or early 1968. The Porsche racing car in the picture above is a Porsche 906! 1967 Porsche Factory Postcards. Image provided by GN, Geneva. 47. Two "Porsche Factory Postcards" from 1967, each 4 x 5.8 inches in size with German text. 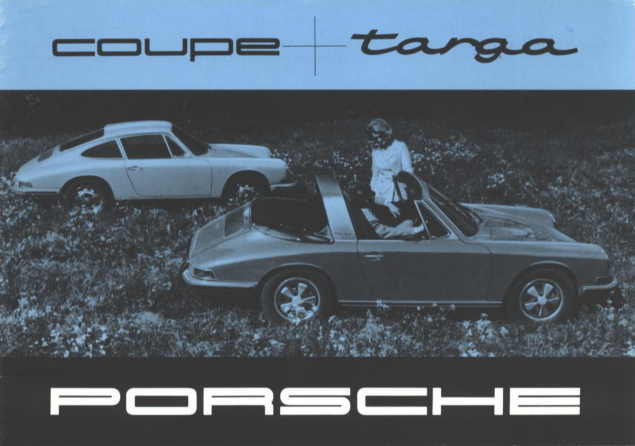 Both were printed in Germany, one shows the Porsche Targa, and the toher shows a Porsche 911-S Coupe. 911-T, 911-L, 911-S & 912 Brochure, August 1967, Image provided by John Bell. 48. This "1967 Coupe/Targa Brochure" was published in August 1967 and emphasises the NEW Targa v. the Coupe. It covers the 911-T, 911-L, 911-S and 912; and there are versions in English, French and German. 911-T, L, S & 912 Porsche, September 1967! Porsche 911 T, L, S & 912 Coupe & Targa Brochure, W218e, September 1967, English. 49. This "White Coupe on the Ocean Brochure" is dated September 1967 most likely for Model Year 1968. It features the 911-T, 911-L, 911-S and 912 Porsches and totals 24 pages. The cover has a cut-out, top center, which shows the white coupe on the inside front page. An interesting note inside says the Targa is "available with left hand drive only"! The brochure incorporates many pictures and images from prior brochures, which is common in Porsche sales literature. Above is the 911-L & 911-S standard dashbord and wheel. Above is the 911-T and 912 dashboard and wheel. An early "Sportomatic" brochure in German, July 1967! 50. This early "67 Sportomatic Brochure" covers Porsche's clutch-less automatic transmission. It is hard to tell if this item is a sales brochure for the new Sportomatic transmission, or an Owner's Manual Supplement. Either could be the case. It has 38 pages and covers the new transmission in detail. 911 Porsche Sportomatic, August 1967! 911 Porsche Sportmatic Brochure, W14e, August 1967, English, Image provided by John Bell. 51. 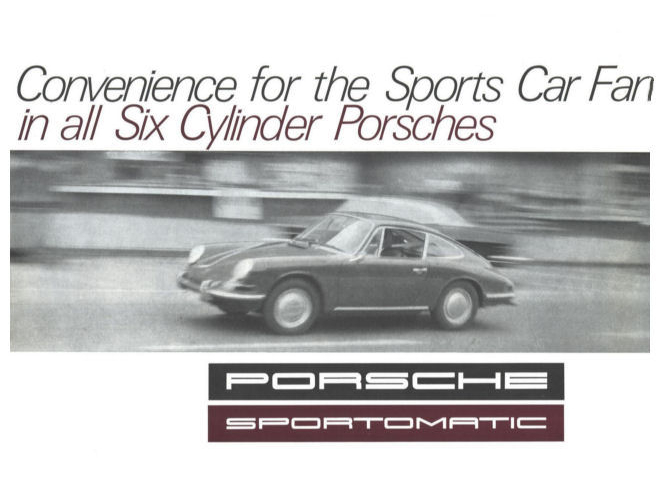 The Porsche "Sportomatic Automatic Clutch Transmission" was further covered in the above 4-page folder published in August 1967. It was Porsche's first attempt at providing an automatic transmission "that eliminated the clutch pedal". It had seven settings: "N" neutral for starting, "D" drive for city driving, "D3" and "D4" two ratios for open road driving, "L" low for steep grades, "R" Reverse, and "P" for Park. 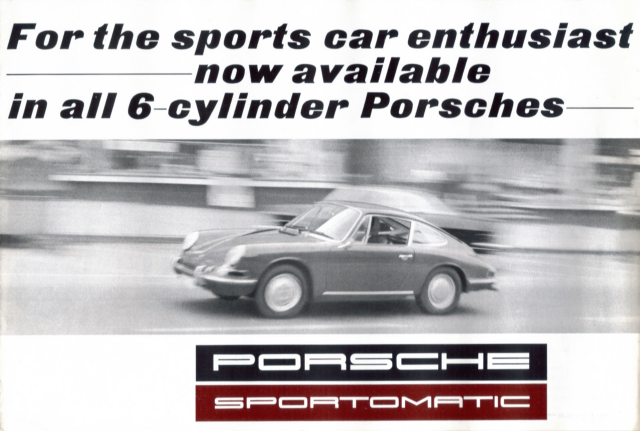 It was available only for the 911 and 911-S.
911 Porsche Sportomatic, September 1967! 911 Porsche Sportomatic Brochure, W14eA, September 1967, English. French version below. 52. & 53. This Porsche "Sportomatic Automatic Clutch Transmission" brochure uses the same images and layout graphics as the prior version except that the text in the brochure has been completely rewritten! This version is dated September 1967 while the prior version was dated August 1967. Reading the text of both brochures reveals no particular reason(s) why the brochure was redone. Porsche Accessory Brochure, November 1967! 911/911L/912 Accessory Booklet, November 1967. 54. This "November 1967 Accessory Brochure" shows the factory accessories for Model Year 1968 in four languages: English, French, German and Italian "per tutti i modelli" (for all models)! 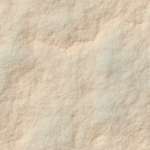 The cover is a brown rough cardboard-like paper. The brochure totals 42 pages. 55. Above is a full-line "Porsche Color Chart for 911's and 912's dated 1967 for Model Year 1968", showing the following standard colors: Slate Grey (6801), Polo Red (6802), Ossi Blue (6803), Light Ivory (6804), Bahama Yellow (6805), Irish Green (6806), Sand (6807), Burgundy Red (6808), and Tangerine (6809). Standard & Special Exterior Paint Colors 1966-1967! Source: Parts Bulletin No. 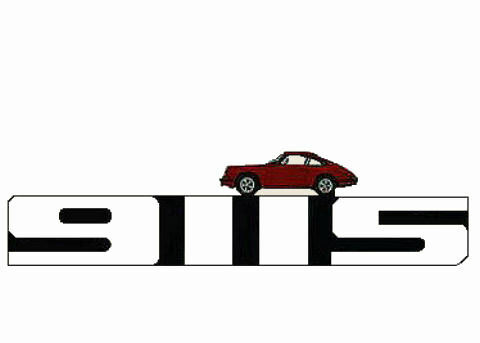 7a, 1966-67, 911/912, dtd 8/68, Porsche Car Distributors, Inc.
911, 911-L & 912 Porsche, January 1968! 1968 Price List for US models! Images provided by John Bell. 56. This little "1968 Price List Folder" is dated January 1968 and lists prices for the 911, 911-L, and 912. The 911-L Targa tops the prices in 1968 at $5,650.00US. 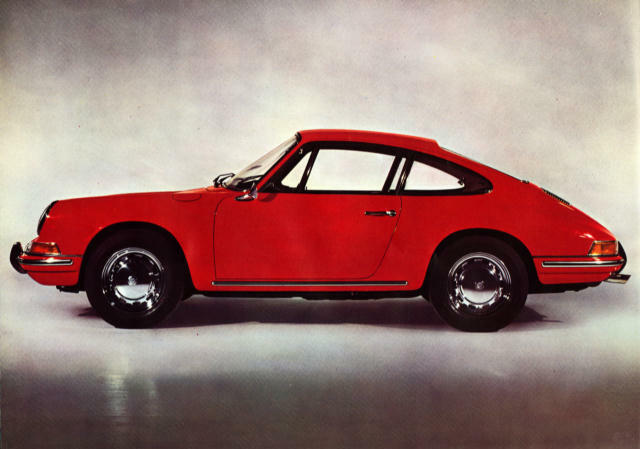 The 911-S was not offered in the USA in 1968 due to emissions problems. 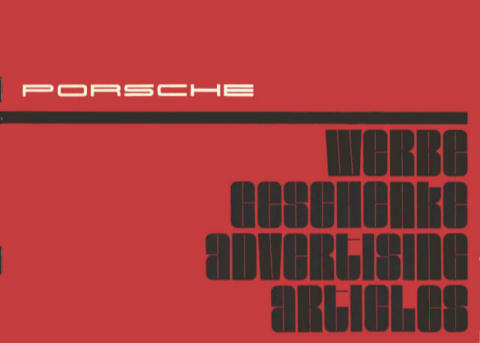 NEW: Porsche Advertising Items, February 1968! February 1968 Porsche Advertising Items Booklet. Images contributed by TJS Geneva. 57. This "Porsche Advertising Items Booklet" is dated February 1968. It contains a listing of Porsche advertising items available to dealers with part numbers, descriptions and and photos. The items include model cars, pen sets, glassware, and all sorts of items that could be bought at your local Porsche dealer. NEW: Porsche 911/912 Color Chart, June 1968! June 1968 Porsche Factory Special Colors. Image provide by TJS Geneva. 58. This "June 1968 Factory Special Colors Booklet" contains unusually large color sample pages which are the same size as this spiral bound booklet. 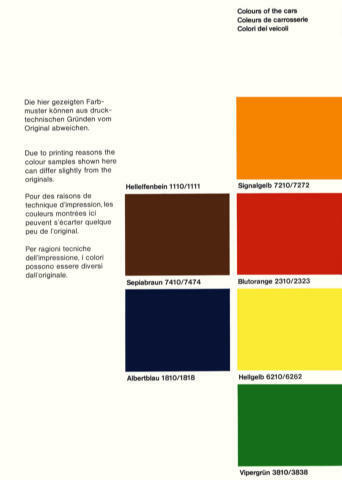 On the back page is a cautionary statement saying that these exact colors cannot be guaranteed and the samples included in the booklet should only be used as a guide. 911, 911-L & 912 Porsche, Undated 1968! Yet another small multi-folder, printed sometime in 1968. 59. This "Gold Coupe in a Green Field Brochure" contains an interesting combination of images from prior brochures. It totals 28 pages, is all color, and measures 9 x 4 inches. It covers the 911, 911-L and 912 (no 911-S!). Nearly all of the images inside can be found in previous brochures. One of the most interesting is below, compared to a similar picture from a 1966 brochure. Look closely at the differences...............and the similarlities! How did they do this? Image from the 1968 Brochure! Image from the 1966 Brochure! Can you count the differences betweem the two images? Above is how the "Accordian Brochure" looks folded up. Below, as it looks unfolded! 60. The "Accordian 911/912 Folder" is an interesting rough paper folder that measures 3 x 9 1/4 inches folded up, and 3 x 18 inches unfolded. It is undated and there is no indication of where and by whom it was published. 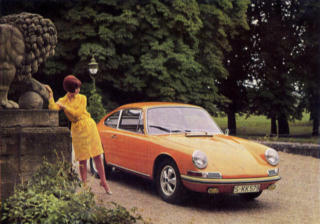 It does mention that Porsche was the winner of the Car & Driver 1967 Readers' Choice Poll for 1967. Given it's size and the fact that it is in English suggests that it was printed in the USA. Porsche Factory Manufacturers Statement of Origin (MSO), 1968! MSO for a 1968 911 Coupe. 61. Ever wonder what a "Birth Document" looks like for a 911 Porsche? Well, a Manufacturer's Statement of Origin (MSO) is the closest thing available. Some would argue that a Kardex is the "real birth document" except most experts say a Kardex is really a warranty record. In any case, the MSO is the document that it is used to obtain a title in the USA. Cars come with an MSO which lists the basic title information, which is then used as the basis to title the car. 911-T-E Porsche Sportomatic, August 1968! 911-T-E Sportmatic Brochure, W14, dated August 1968, German. 62. 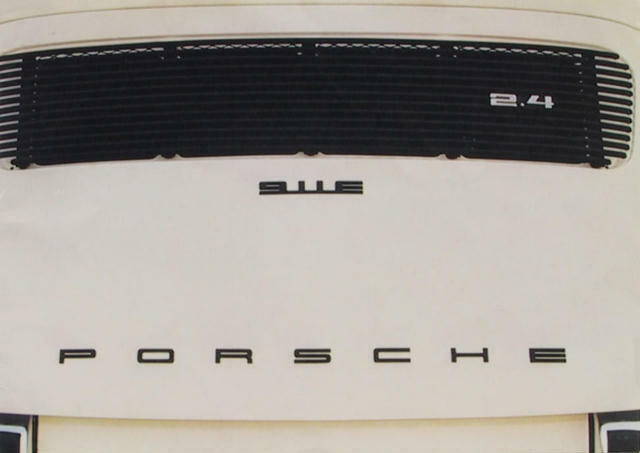 The "911-T 911-E Sportmatic Folder" describes Porsche's clutch-less automatic transmission for Model Year 1969, available only for the 911-T and 911-E. 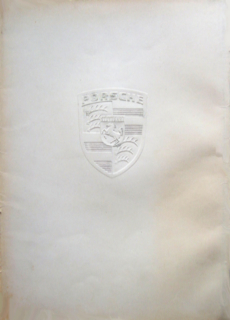 It is a simple 4-page folder published in August 1968 by Porsche Stuttgart-Zuffenhausen. NEW: 911-T, E, & S & 912 Porsche Price List (Model Year 1969), August 1968! 63. This "Porsche Price List for Model 1969" was published in August 1968, and has prices for the 911-T, 911-E, 911-S and 912, and also has pictures of several new model changes. 911-T, 911-E, 911-S & 912 Porsche, September1968! 911-T, 911-E, 911-S & 912 Porsche Brochure, W218f, dated September 1968, French. 64. 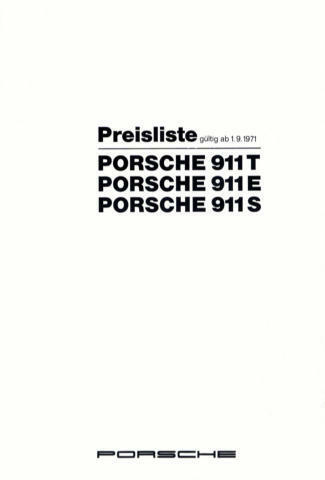 This "Plain Gray Full Line 911-912 Porsche Brochure" covers the full line of Porsches available for Model Year 1969. The cover is almost like gray cardboard, but the inside pages are all slick color. It totals 22 pages and comes in various language versions. The above image is of the French language version from Sonauto, the French Distributor. For whatever reason, this brochure is tough to find and getting up there at auction. If you have a 1969 model Porsche, this brochure would be a nice addition to your documentation for the car. An optional interior combination for Model Year 1969! 911-T, 911-E, 911-S & 912 Porsche, September & October 1968! 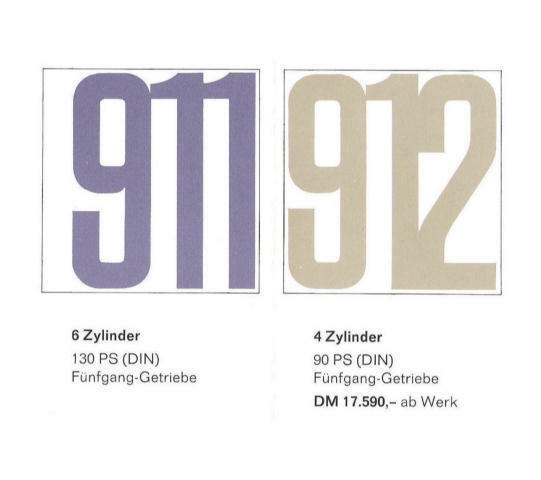 911-T, 911-E, 911-S & 912 Porsche Factory Accessories, September 1968. 911-T, 911-E, 911-S & 912 Porsche Factory Price List, October 1968. 65. & 66. Above are the "September 1968 Factory Accessories Brochure" and the "October 1968 911/912 Price List", both of which were for Model Year 1969. Recall that Porsche model change-over usually begins in the September prior to the actual Model Year! Divide the DM price by 4 to get the Dollar price! 911 & 912 Porsche of America Corp. Price List, January 1968! January 1968 Porsche of America 911/912 Price List. NEW: 67. This "January 1968 Porsche of America Price List" shows prices for the 911, 911L and 912 for Model Year 1968 together with prices for various accessories both P.O.E Newark, New Jersey and if picked up at the factory. Notice that the electric sunroof option costs $395.00 delivered in Newark compared to $225.00 at the factory. Add up the price savings for a 911 or 912 together with some nice savings on accessories, and you have some cash for a Europen vacation after picking up your new Porsche at the factory! 911 & 912 Porsche, Spring 1968! 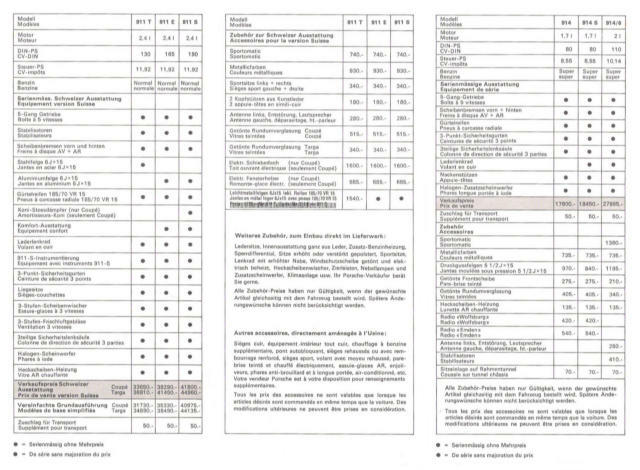 Spring 1968 Porsche Distributors & Dealers Listing. Image provided by KN, Geneva. 68. This "1968 Spring Edition Distributors & Dealers Listing" totals 20 pages and is approximately 8.5 x 5.5 inches in size. It is in English and is printed in the USA. 911-T, 911-E, 911-S & 912 Porsche, Undated late 1968 or early 1969! A small multiple folder sales brochure printed sometime in 1969. 69. This "Blue Targa Brochure" is a multi-fold folder measuring 8 1/2 x 4 inches folded up. It covers the 911-T, 911-E, 911-S and 912 for Model Year 1968. It is undated but was published in Germany. It mentions winning Car & Driver's 1968 "Readers' Choice" Poll. Tourist Delivery Folder, Undated late1968 or early 1969! Undated Tourist Delivery Folder, 1968. Image above provided by John Bell. 70. & 71. These "Tourist Delivery Brochures" cover Porsche's program for tourists who want to order their Porsche and pick it up at the factory. In the 1950's and 1960's, the price savings by picking up a new Porsche from the factory was more than enough to pay for a European vacation. Hence, the continuing popularity of this program. It is not clear why there are two versions of this brochure although one may be for a different model year. The "green version" mentions 1969 models. 911 Porsche Racing, Undated (Est. Late 1968 or Early 1969)! 72. This "Racing: The Ultimate Proof Brochure" is undated and totals 12 pages. 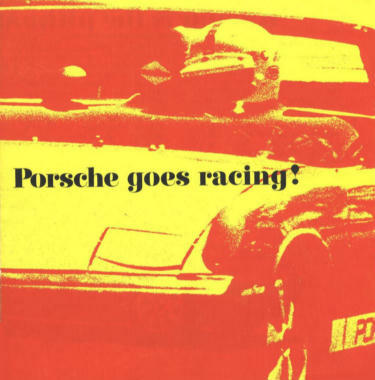 It was published by Porsche in late 1968 or early 1969 and describes Porsche's racing activities, and how racing concepts apply to the cars sold to the public. Some current model pictures are shown but without any technical specifications. 1969 Porsche Racing Brochure. Image provided by GN, Geneva. 73. This "1969 Porsche Racing Brochure" totals 34 pages, is in black and white, and color, ane is approximately 4 x9 inches in size. It is in English and is printed in USA by Porsche+Audi Division. 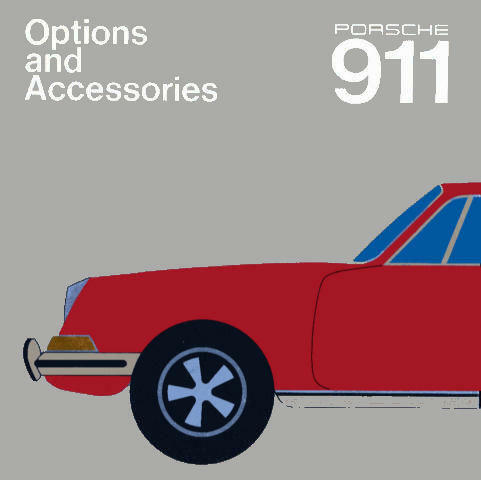 911-T, 911-E, 911-S & 912 Porsche Accessories, 1969! 74. "1969 Porsche Accessories" is a small booklet listing all of the factory accessories available for 1969. Included is the factory air conditioning option which fits along the bottom of the dashboard. 75. 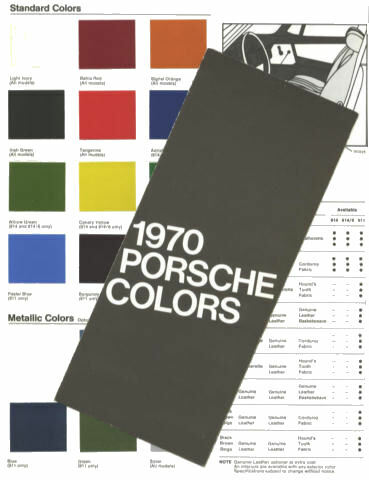 The "1969 Color Chart" is odd because it has a publication date of June 1968, but a sticker has been placed on the back of the brochure suggesting that the color chart was used for the 1969 Model Year. 911-T, 911-E, 911-S & 912 Porsche, 1969! "Fact Book" is a 26 page brochure, undated 1969. 76. The "Fact Book Brochure" totals 26 pages and was published sometime in 1969. It covers the 911-T, 911-E, 911-S and 912 Porsches. It measures 8 x 5 1/4 inches, and is all color. Many of the images in this brochure are also shown in earler brochures. 911-T-E-S Porsche, Late 1969 or Early 1970! Brochure in German for new 2.2 liter motor! Brochure in French for new 2.2 liter motor! 77. This "Die Neuen 2.2 Liter Motor Brochure" is undated but was probably published in late 1969 or early 1970 for the models with the new 2.2 Liter motor. The brochure inside is all color, despite its mostly all white cover, and has technical information on the back cover. The brochure was published by VW-Porsche Vertriebsgesellschaft MBH, Stuttgart, in the German language. There may or may not be an English version of this brochure. 1970 Factory Accessories Brochure, printing #55-11-01011. 78. This "1970 Porsche Factory Accessories Brochure" totals 30 pages of black & white images and measures approximately 8.5 x 8.5 inches. The text is in English and it was printed in the USA. 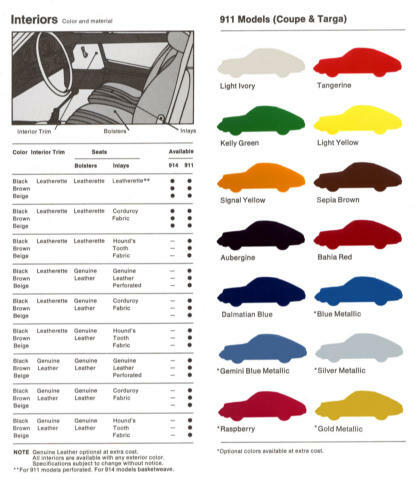 1970 Porsche Color Chart, Image provided by John Bell. 79. 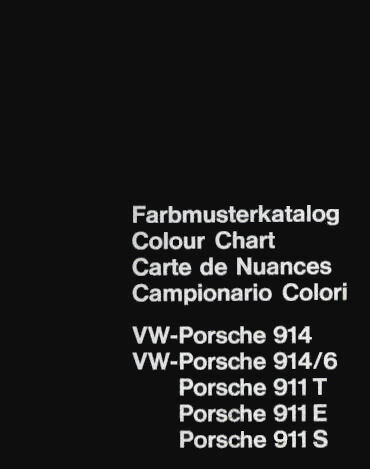 This "Porsche Color Chart for 1970" does away with the traditional 4-digit color numbers. Also included are colors "only for the 914 and 914-6. 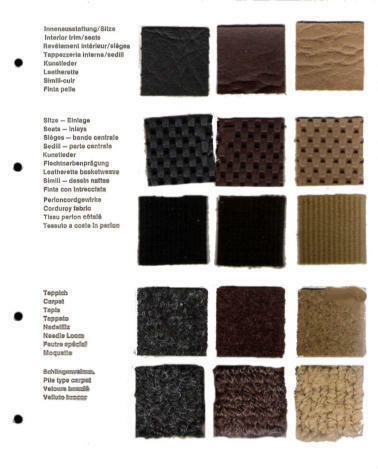 A chart inside the folder lists the standard interior-exterior color combinations. Above is front cover of brochure when folded. 1970 Maintenance Folder. Above folder opened up. 80. 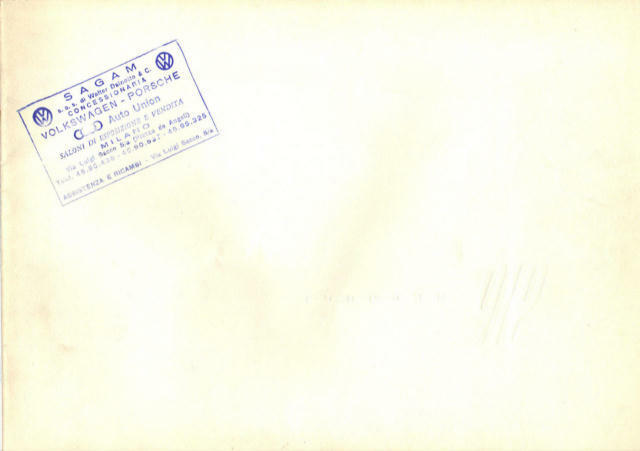 "1970 Maintenance Folder" published by Porsche+Audi Division of Volkswagen. 911-T, 911-E, 911-S, 914, 914-6 & Targa.......Six Ways! 1970. 81. "Six Porsches" is a small 3 3/4 x 9 inch 16 page brochure that for the first time shows the 914's together with the 911's. The brochures were published in USA and cover the 911-T, 911-E, 911-S, 914, 914-6 and Targa! 911-T, 911-E & 911-S, 1970, English. 82. This "No Matter which....911 Folder" is huge, measuring 10 1/2 by 14 inches. 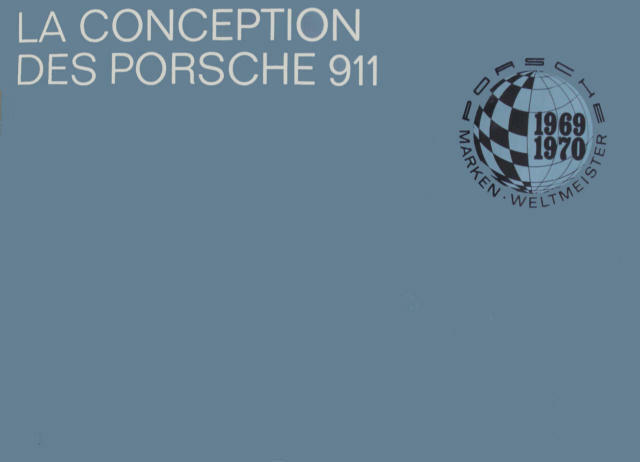 The cover is black and white as shown above, and the inside pages are one large color picture showing the 911-T, 911-E and 911-S Porsches plus a Targa. The back cover has complete technical specifications. The folder appears to have been printed in Germany for the USA market. 911-T-E-S Porsche, late 1970 or early 1971! 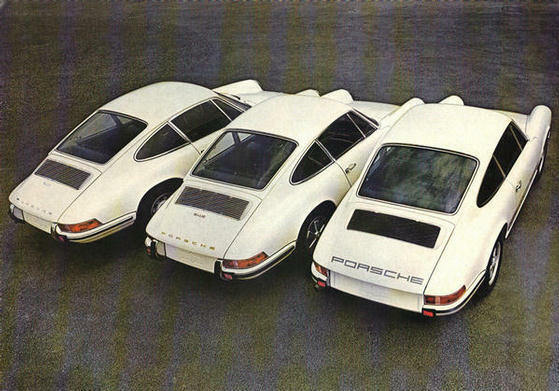 911-T, 911-E & 911-S, 1970, French language version of "The Porsche 911 Concept"! 83. 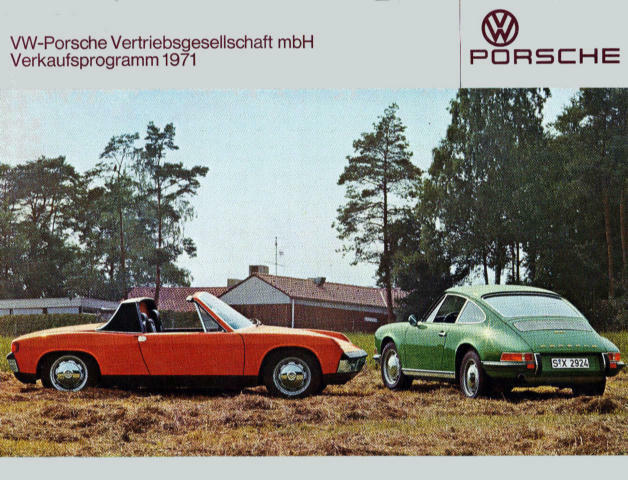 The "La Conception des Porsche 911" is an extra large, all color, deluxe brochure published in Germany sometime in late 1969 or early 1970 by VW-Porsche Vertribsgesellschaft MBH, Stuttgart. It includes a short history of the 356 Porsches, and covers the 911-T, 911-E and 911-S. This brochure is the French language version and is very similar to the two large brochures which follow. It may be the earlier of the three brochures with the changes to blue covers and adding the world championship logo coming later in the year when the standings were finalized. 1970 "Weltmeister" Brochure, English version! 1970 "Weltmeister" Brochure, German version! 1970 "Weltmeister" Brochure, French Version. Image provided by GN, Geneva. 84. 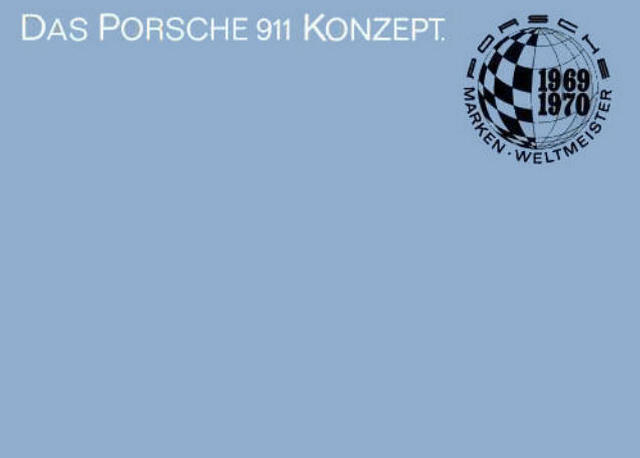 The "Porsche 911 Concept Weltmeister Brochure" is an extra large, all color, deluxe brochure published in Germany sometime in late 1970 by VW-Porsche Vertribsgesellschaft MBH, Stuttgart. It includes a short history of the 356 Porsches, and covers the 911-T, 911-E and 911-S. 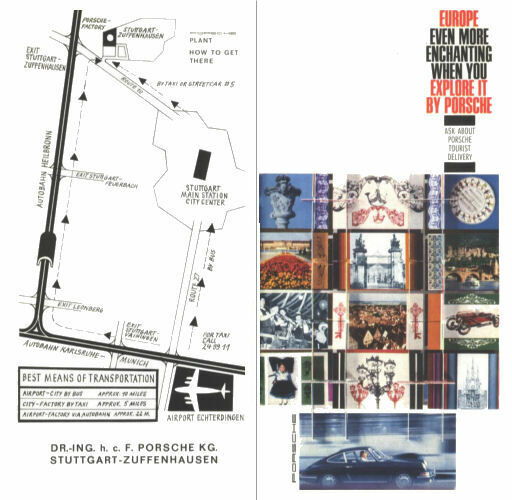 The cover shows a graphic which represents Porsche's racing world championships in 1969 and 1970. A message in the inside first page from Ferry Prosche. Birth of a 911 Porsche..........1971 Factory Tour! Order the Booklet that shows the 1971 Factory Assembly Line! The 911 Factory Tour Booklet, 20 pages, 8 1/2 x 11 inch format! This is a 20 page, 8 1/2 x 11 inch, slick paper booklet, featuring pictures taken along the Porsche Factory Assembly Line. The images were taken by this author on the factory assembly line in 1971! They show individual Porsches in various stages of the manufacturing process from the beginning main-body jig to the end with a finished 911 driving off the assembly line! Each step on the line is covered in detailed B&W photographs. See Coupes and Targas moving from Body Fabrication to Engine Assembly to Final Assembly. If you have a late 60's or an early 70's 911/912 Coupe or Targa, you'll be interested in this Custom Booklet to see how your car was put together! Click here to Order the 911 Factory Tour Booklet! 911-T, 911-E, 911-S, 914, 914-6 & Targa.......Six Ways! 1971. 85. The "Six Ways" brochure is a small 3 3/4 x 9 inch 16 page brochure that shows the 914's together with the 911's. The brochure was published in USA and cover the 911-T, 911-E, 911-S, 914, 914-6 and Targa! Images provided by GN, Geneva. A 1971 Booklet explaining Porsches new sales organization. 86. In 1971, Porsche published "Today's Porsche Organization" to explain it's new sales organization, first started in 1969 known as the Porsche+Audi Division. Karl Ludvigsen, in "Porsche, Excellence Was Expected", described this situation as follows: "In the last days of January 1969 the plan was announced in both countries. In Germany, VW and Porsche would found a new company, owned by both, to sell sports cars made by both firms. In the United States, Porsche would give up the distribution rights for its own cars to Volkswagen, which would establish a new Porsche+Audo Division to sell both those makes in the U.S."
911-T, E & S Porsche, 1970, English (USA). Brochure Cover on left, Ferry Porsche right on inside cover page. 87. This "Porsche, a Love Story" was probably published in 1970 as it deals with the 2.2 liter motors for the 911-T, 911-E and 911-S rated at 142hp, 175hp, and 200hp SAE. Unlike prior brochures, it has a semi-slick cover and lower quality paper inside. The brochure was printed in the USA possibly by Porsche of America Corp.
1971 Porsche T, E & S Folder. Image provided by GN, Geneva. 88. 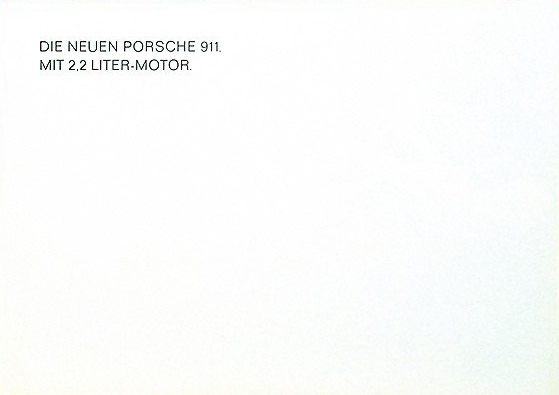 This "1971 Porsche T, E & S Folder" totals 4 pages and is approximately 8.5 x 12 inches in size. The text in this example is in Dutch (there are versions in French, German, English and Italian as well). Folder was printed in Germany. 911-T-E-S & 914 Porsche, 1971! 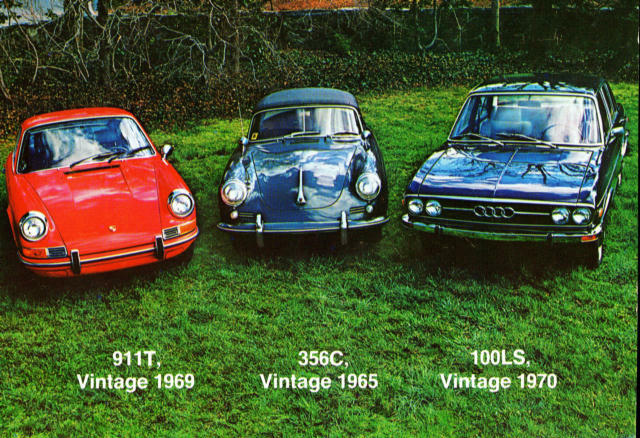 1971 911, 912 & 914 Brochure. Image provided by GN, Geneva. 89. This "1971 911, 912 & 914 Brochure" totals 40 pages and is approximately 8.5 x 12 inches in size. Text is German and it was published in Germany by VW Porsche. 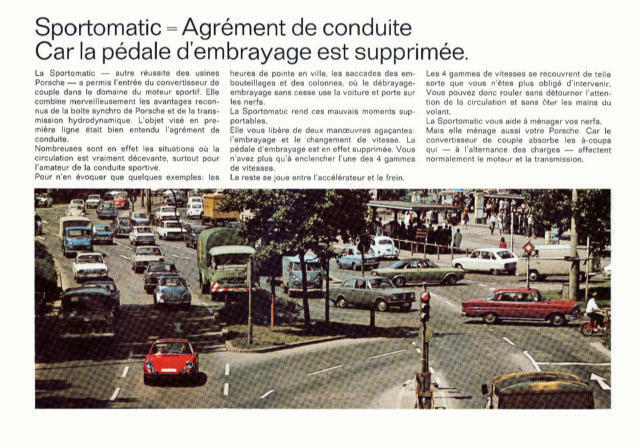 1971 Porsche Sportomatic Brochure in French. Images provided by GN, Geneva. 90. This "1971 Porsche Sportomatic Brochure" totals 4 black and white and color pages, and is 8.5 x12 inches in size. The text of this brochure is French, although printed in Germany. 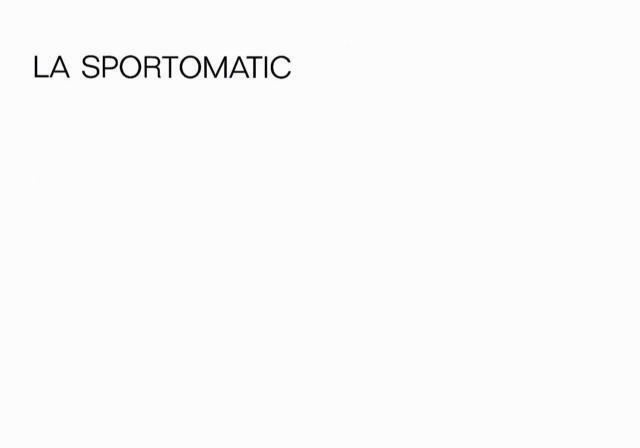 It covers Porsche's automatic........The Sportomatic transaxle. 911-T-E-S Porsche European Delivery, 1971! 1971 Europen Delivery Price List. Image provided by GN, Geneva. 91. This is a "1971 Porsche European Delivery Price List". 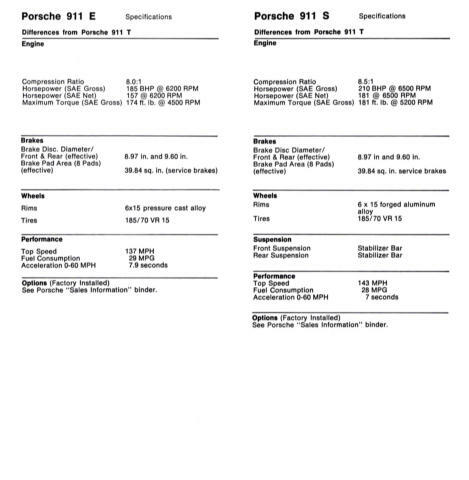 It shows the prices of the 911 series Porsches with US specifications, and includes the 914 and 914-6. It is a mostly black & white folder approximately 4 x 6.5 inchs in size and it was printed in English in the USA. 1971 Porsche Accessories Brochure. Image provided by GN, Geneva. 92. Above is a "1971 VW-Porsche Factory Accessories Brochure" which totals 20 pages of black & white images and text, and is approximately 4 x 6.5 inchs in size. The test is in German, English, French and Italian and it was published in Germany by VW Porsche. Included are accessories for the 914 and 914-6. Porsche colors for 1971 (not all shwon). Images provided by John Bell. 93. 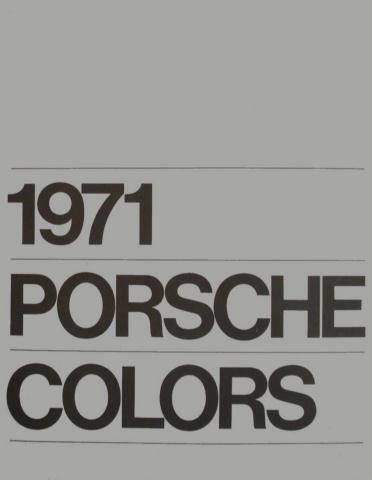 This is a "1971 Porsche Color Chart", but what is shown above is not all of the colors. 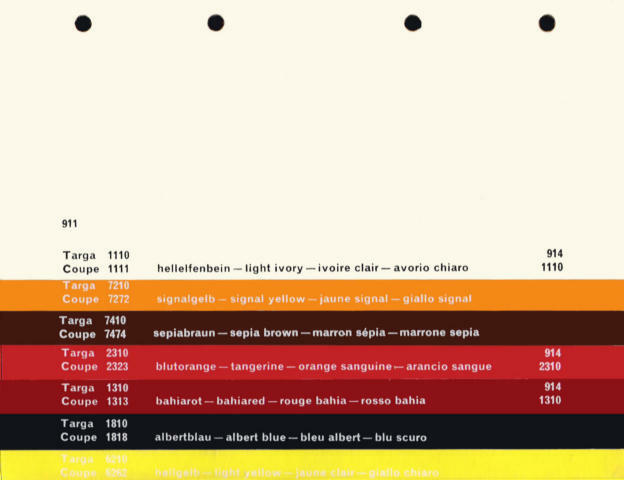 1971 Multi-language Color Chart. Image provided by GN, Geneva. 94. This is another "1971 Color Chart" in the form of a folder approximately 4 x 6.5 inchs in size. Text is in German, English, French and Italian and it was printed in Germany. 1971 Porsche Special Colors. Image provided by GN, Geneva. 95. 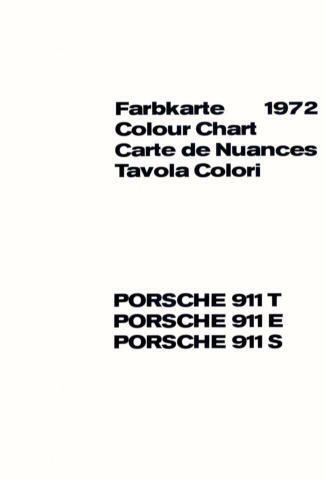 The above "1971 Porsche Colors" show available colors for the Porsche 911 series cars and the Porsche 914. The images are of pages from a flat spiral bound manual in which a clear see-through black and white line image of a 911 or 914 could be superimposed over a desired color to see what the combination looked like. The car images were spiral bound at the top, and the colors were spiral bound on the left side making this a handy dealer booklet to show to potential buyers. 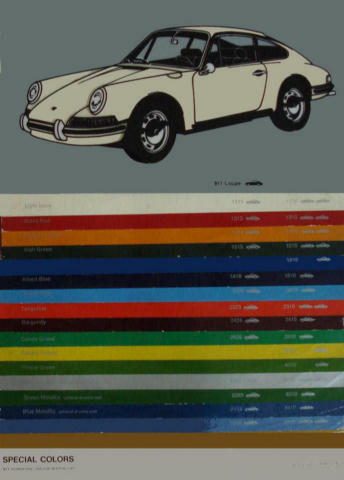 Porsche used a similar spiral bound manual for colors for Porsche 356-C's. Porsche 911 T, E & S Price List, 1971! 1971 Price List. Image provided by GN, Geneva. 96. This "Porsche 911 T, E & S Price List", for Model Year 1972, totals 4 pages and is the German language version, printed in Germany. NEW: Porsche 911-T, E & S, and 914/914-6 Sample Book, 1971! 1971 Porsche Exterior Color and Interior Upholstery & Carpet Sample Book. Images contributed by TJS Geneva. 97. This "1971 Porsche 911 T, E, & S and 914/914-6 Exterior Color and Interior Upholstry & Carpet Sample Book" was primarily available to dealers to show potential customers the exterior and interior combinations that could be ordered from the factory. Special orders of colors and interiors could also be had for the asking and a price! 98. This "1971 Vintage Postcard" measuring approximately 4.2 x 6 inches, was printed in the USA by Volkswagen-Porsche of America. On the front side are shown a vintage 1969 Porsche 911T, a vintage 1965 Porsche 356C, and a vintage 1970 Audi 100LS. Text on the reverse says: "Porsche Audi Classics. Purchasing a used Porsche or Audi is an investment., not only in driving pleasure, not only in pride of ownership, but also in retained high value over the years. A selection of guarenteed Porsches and Audis awaits your inspection at our used car dept." These small maintenance flyers were probably sent to customers by mail. No specific Porsche model mentioned! 99. thru 104. The above items are "Maintenance Flyers" used by dealers in 1971. They were mailed to customers reminding them to bring their Porsches in for regularly scheduled maintenance. 911-T, E & S Porsche, 1972, English (USA). Cover on left. Inside front cover same as on similar 1971 brochure! 105. This "Moonlight by the Ocean Brochure" was probably published in 1972 as it includes the new 2.4 liter motors for the 911-T, 911-E and 911-S rated at a reduced horsepower from 1971 of 133hp, 157hp and 181hp respectively. As with a similar 1970 brochure, this 1971 brochure has a semi-slick cover and lower quality paper inside. 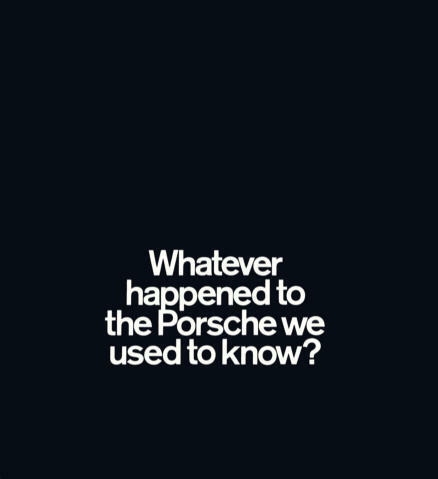 The brochure was printed in the USA possibly by Porsche of America Corp.
911-T, 911-E & 911-S, Undated 1972. 106. 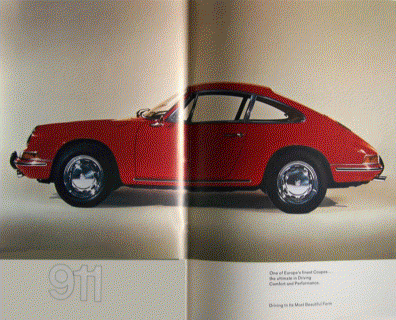 This large format "1972 Deluxe Brochure" measures 8 3/4 x 13 3/4 inches and covers the 911-T, 911-E and 911-S. There are two versions of this brochure, perhaps more, in addition to possible language versions. The first version was published by VW-Porsche Vertriebsgesellschaft MBH, Ludwigsburg, with the printing number W48-e-010-971-0704, printed in Germany. The second version just says: "Printed in Germany, SVA, Ludwigsburg" with a printing number 1006.23. Most of the pictures inside the brochure are different from one brochure to the other although the cover is exactly the same. No reason known for why there are two versions. There are no technical specifications included but they may have been covered in a separate removable technical section. 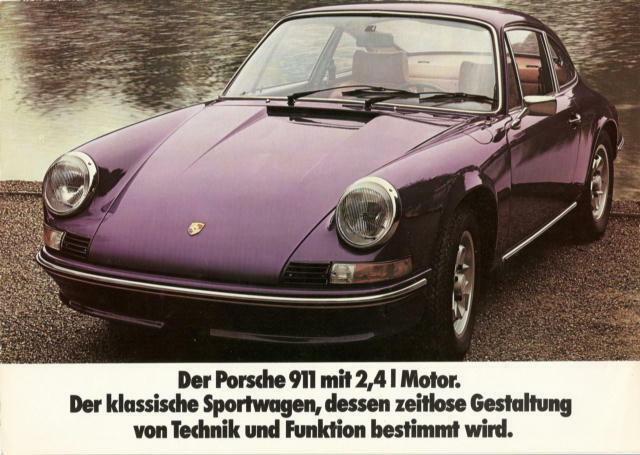 NEW: 911-T-E-S Porsche Price List, February 1972 Switzerland! February 1972 Porsche Factory Price List Folder. Images contributed by TJS Geneva. 107. 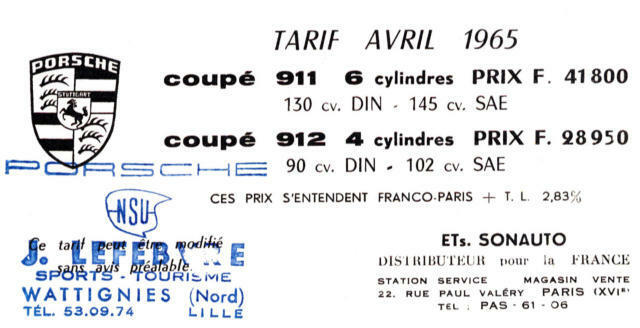 This "Swiss Porsche 911-T, E & S Price List" is dated February 1972 and appears to be in French and German for the Swiss market. It lists the standard equipment by model, and optional equipment with prices. Two language versions 911-T, 911-E & 911-S, 2.4 liter motor, Undated 1972. 108. & 109. 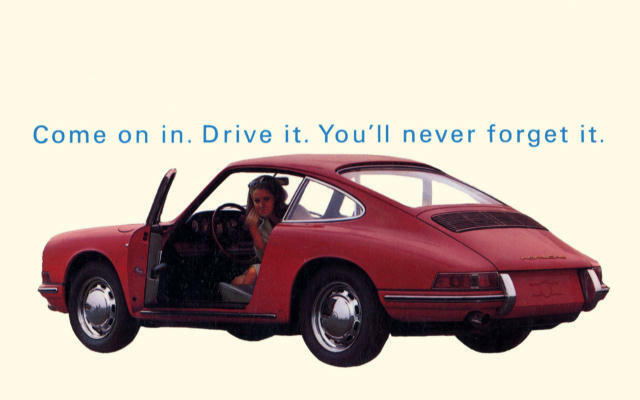 The "New 911 with 2.4 Liter Engine" folder introduces the 2.4 liter motor for the 911-T, 911-E, and 911-S for Model Year 1972. The folder is undated but believed to have been published in late 19721or early 1972 by VW-Vertriebsgesellshaft MBH, Ludwiwsburg, Germany. Inside the folder are color pictures of the engine, interior, with technical data on the back cover. Notice the airdam below the front bumper. 911-T-E-S Porsche Color Chart, 1972! 1972 911 T, E & S Porsche Color Chart. Image provided by GN, Geneva. 110. 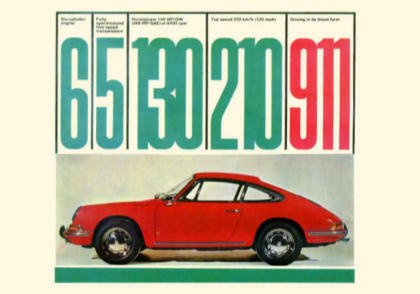 "1972 Porsche 911 T, E & S Color Chart", 4 pages, approximately 6 x 8.5 inches in size. Text is German, English, French & Italian, printed in Germany. 111. This "Accessories 1972 Brochure" lists and shows accessories for Model Year 1972. 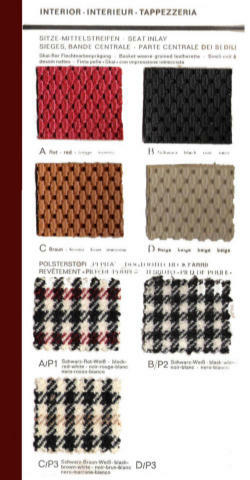 The all-color brochure has 16 pages and was printed in the USA by Porsche+Audi, a Division of Volkswagen of America. Accessories include such things as: roof mounted ski rack, bumper guard rails, mag wheels, racing stripes, rear seat luggage straps, aluminum fender strips, chrome rocker panels, 911-S instruments, walnut gearshift knobs, air conditioner, center console, and mag wheel covers! Some of these accessories may be after-market accessories and not factory acccessories! MAG WHEEL COVERS? 112. 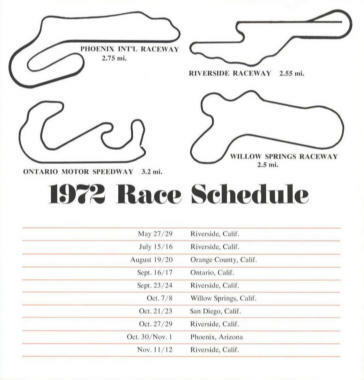 This "1972 Porsche Racing Brochure" lists the racing schedules for Porsche for 1972. It was published in late 1971 for the 1972 season. In addition to race dates, it also has information about individual race tracks. 1972 B&W Folder. Image provided by GN, Geneva. 113. "1972 Black & White Folder" approximately 4.5 x 8.5 inches, English, printed in USA. 114. This "1972 Porsche Advertising Articles" Brochure lists such items as: arm patches, wall plaques, model toy cars, books, pens, cigarette lighters, key fobs, bill-folds, scarfs, ash trays, memo pads, posters, doilie and napkin sets, table pennants, luggage, table lamps, drinking glass sets, and much more. All these branded items come with the Porsche crest and logo. Many of these items have become collectable and sell for big bucks. 911-T, 911-E & 911-S for 1972. 115. This "1972 911 Single Sheet" shows an orange 1972 911 on a black ground. On the back side are detailed technical data. This single sheet was printed in the USA. Above image of German language version provided by Andrea from Italy. 3 language versions, French, German & English 911-T, 911-E & 911-S, 2.4 liter motor, Undated 1973. 116. & 117. The "Model Year 1973 with 2.4 Liter Engine" folder highlights the 2.4 liter motor for the 911-T, 911-E, and 911-S for Model Year 1973. The folder is undated but believed to have been published in late 1972 or early 1973 by VW-Vertriebsgesellshaft MBH, Ludwiwsburg, Germany. Inside the folder are color pictures of the engine, interior, with technical data on the back cover. Notice the airdam below the front bumper. 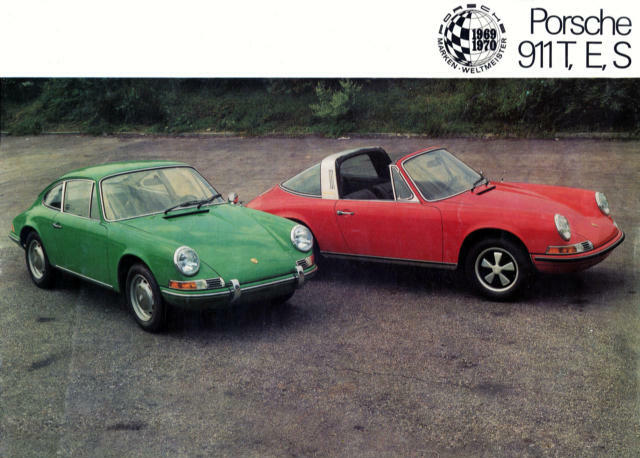 911-T-E-S, 914 Porsche & Audi Color Chart 1973! 118. 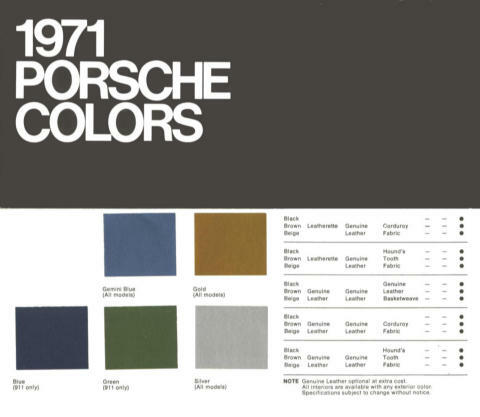 The "1973 Porsche Color Chart" included color samples for both the 911 series and the 914, together with color and interior fabric combinations. 1973 Specifications. Images provided by GN, Geneva. 119. "1973 Specifications Folder" by Porsche+Audi. 911-T-E-S, 914 Porsche & Audi 1973! Image provided by GN, Geneva. Full line folder for Porsche 911's, 914's and Audis for Model Year 1973. 120. The "Keys in Hand Folder" is for Model Year 1973 and measures approximately 7.5 x 7.5 inches in size. The text is in English and the folder was printed in the USA by Porsche + Audi. It covers the full range of Porsches and Audis for 1973. The Racing 911 RS 1973! Above is the Very Rare 911 RS Brochure for a car built strictly for Racing! 121. The "911 RS Brochure" is undated but probably published by VW Porsche Vertriebsgesellschaft mbH, Ludwigsburg sometime in 1973. The 8 page color brochure includes a single black and white sheet showing the corrected placement of the Carrera RS emblem on the rear deck. The Carrera RS is famous for winning the Twenty Four Hours of Daytona in February 1953, the first ever victory for a 911 in a major international endourance race! This brochure is very rare and commands a very high price at auction. This website was updated on 3/5/11 and will be continuously updated in the future with additional material & mores brochures. 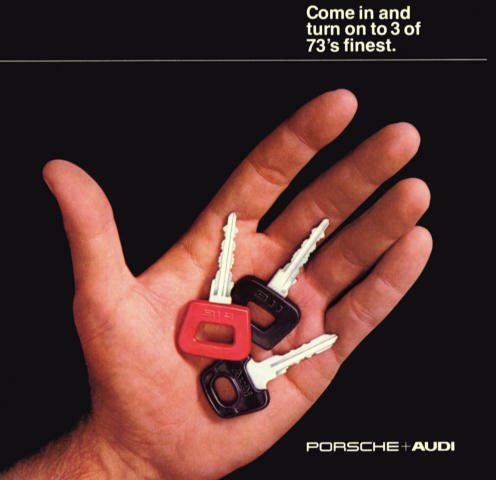 This is a historical chronology of Porsche 911/912 showroom sales literature from 1963-1973.